In stock -This product will ship today if ordered within the next 15 hours and 11 minutes. Valdrian Valerian Root (Valeriana officinalis L) is a traditional herbal medicinal product for the temporary relief of symptoms of mild anxiety and to aid sleep, based on traditional use only. Valerian Root (Veleriana officinalis L.), Hypromellose (capsule shell). The capsule shell is made from hypromellose. For the temporary relief of symptoms of mild anxiety: Take 1 capsule 3 times a day with water. To aid sleep, take 1 capsule 30 minutes before bedtime, swallowed with water, with an additional dose earlier in the evening if necessary. Maximum daily dose 4 capsules. Not recommended for children or adolescents under 18 year of age. 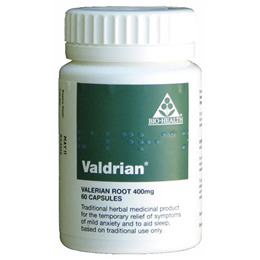 Patients with known hypersensitivity to Valerian root should not use Valdrian. If symptoms persist, or adverse reactions not mentioned in the leaflet occur, consult a doctor or qualified healthcare practitioner. As the effects of this product may not occur immediately, the capsules should be taken continuously for 2-4 weeks. Below are reviews of Valdrian - Valerian Root - 60 x 400mg Capsules by bodykind customers. If you have tried this product we'd love to hear what you think so please leave a review. Any 400mg valerian capsule will do the job. This is good quality and a good price. If I wake in the night I take two and go straight back to sleep. If anxious during the day I take one. Works every single time. Have tried lesser strength valerian and it does not work so the strength seems key. Excellent product with no morning after hangover feeling. This product works well. I have had insomnia for more than five years. I refuse to take any more drugs. I start my evening with a muscle relaxant at 7,30. Then around 9 I take Melatonin, which is great. Then around 11 I take this. This gets me off to sleep normally in an hour. It helps if you are anxious or agitated during the day, to take one around midday as well. Great product. 2-3 really help with sleep. This product is of very good quality. Highly recommended. Bio Health Valdrian Valerian Root is a traditional herbal medicinal product for the temporary relief of symptoms of mild anxiety and to aid sleep, based on traditional use only.